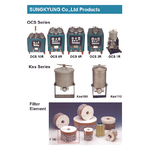 Our TÜV, ISO9001, ISO14001, CE1, CE2, RoHS registered quality oil purifier equipments and filters allow us to have customers who eager to conserve energy and prevent environment pollution through production process. We are currently providing our products for various industrial sectors such as, Automotive/Tire/Ship-building/Steel/Power Plant/Paper/Plastic industries, etc. in Finland, Poland, Korea, Japan, Saudi Arabia, Chile, etc. Naše TÜV, ISO9001, ISO14001, CE1, CE2, RoHS registrované čistící zařízení a filtry kvalitního oleje umožňuje, abychom měli zákazníky, kteří touží šetřit energií a předcházet znečišťování životního prostředí prostřednictvím výrobního procesu. V současné době poskytujeme naše výrobky pro různá průmyslová odvětví, jako je, automobilový prům. / stavba lodí / ocel / elektrárny / papír / plasty, atd. ve Finsku, Polsku, Korei, Japonsku, Saúdské Arábii, Chile, atd. Our Oil Purifier; offers Pre-arrangement feature for self-operation / Rational refining management. Our Oil Purifier Machine; offers Adoption of pressure control valve / Maximum efficiency of oil filtration by the detection of element-changing time. Our Oil Refining; oil refining has adoption of dustproof gauge / Verification of contamination status & exact element-changing time by accurate pressure. Our Oil Cleaner; offers efficiency used by the record of refining time. Custom-made is possible upon request. Our Fuel Oil Purifier; offers a function that filters oil with the power of machine itself, so electric power is not needed. Our Oil Recycling; enables oil to be filtered automatically during the operation of machine so there is no additional management. Our Oil-water Separator; - separates only 0.5mm layer of pure oil by the flotation agent developed in-house, and by adding the function of water-level control by buoyancy and specific gravity, - offers Anti-Rust Treatments. Nabízíme různé druhy čističů olejů a maziv pro různá použití. We are looking for potential customers in European countries in various industry areas such as; Iron & Steel Industry, Oil & Chemical Industry, Foundry Cast-Iron Product, Automobile-Related Industry, Heavy Construction Facilities, Paper Making Industry, Printing & Textile Industry, Various Oil-Pressure Unit, Aircraft Industry, Ships Industry, Automotive Industry. Těšíme se na potenciální zákazníky z evropských zemích z různých průmyslových oblastí.